For Mackenzie, Camryn, Darinka and Madison, overcoming an injury-prone start to their 2017 tennis season proved tough – especially while balancing their school work. As student-athletes, they sacrificed their social lives and sleep to become the first Chicago Public Schools team to win the state tennis championship. 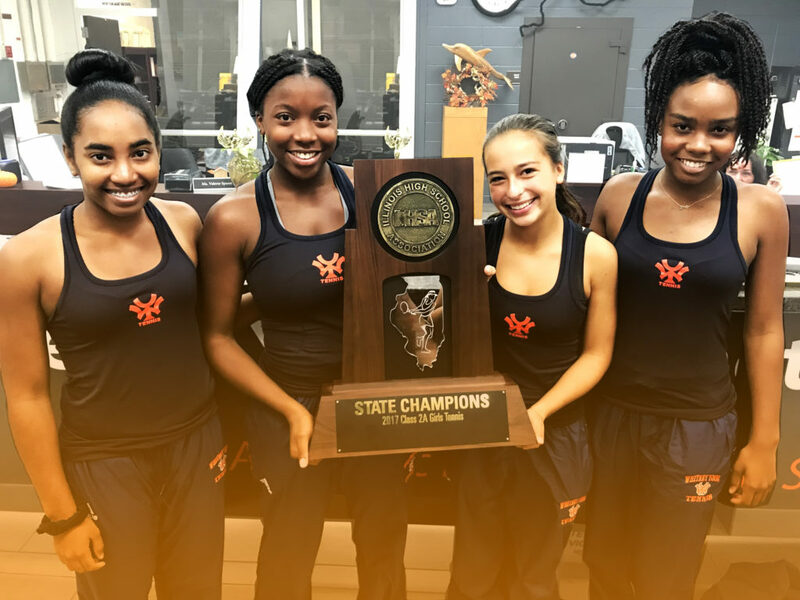 We caught up with the Whitney Young girls soon after their win to learn more about the challenges each overcame to achieve their dream. I always knew I wanted to come to Whitney Young. They have the best team in the city. It’s a lot of sacrifice to be a student athlete. Everybody knows that. You try to keep school first but tennis is a really big commit. We’re still making up tests and school work from state or from sectionals. You really lose sleep over this – Camryn, 17, Senior & Team Captain. I also wanted to go to Whitney Young because I heard it was a well-known school, academically and with sports. But, like Camryn said, it’s really hard to balance school work and tennis – Mackenzie, 17, Senior. I’ve been playing tennis since I was really young. My brother went to Whitney and I saw how great the tennis program was. That helped and motivated me – Darinka, 15, Sophomore. The biggest thing I had to overcome was balancing school with tennis. Sometimes, I value tennis more than school. Then it’s like, ‘Oh. I’m falling behind in school. I need to value school more.’ Then it’s, ‘Oh. I’m getting rusty in tennis now.’ It was a struggle at the beginning but I got into a rhythm by going to practice everyday and tutoring – Madison, 17, Senior. I’ve missed so many lunch periods this quarter. I had to go talk to my teachers. One teacher gave me a 6 out of 15 for participation for the week because I was away at state. I have to write an essay for each day I was gone just to earn those points back – Darinka. This year was different. Because we’re seniors and we’re applying to colleges, we don’t get much sleep. I had to make a choice. Do I want to sleep or do I want to be productive in school and tennis and go to college? That’s the tradeoff. On bus rides to games, I would take out some work. While waiting on a match, I would take out some work. During lunch period, I would take out some work and talk to teachers [about my sports schedule]. Some teachers are very understanding, and will let you make up a test. Other teachers took off points every day I was away at state. – Camryn. I don’t have a lot of free time. When I do have free time, I try to be productive. I chose to have Instructional Support this quarter, which is a free period where you can do whatever you want. During that period, I do all the work I can. During my lunch periods, I do work. Most of the time, I stay after school and do more work. I also have practice after school and more work after that. I have work all day, every day – Mackenzie. It’s hard to play tennis and have a social life and do your homework. I missed hella parties. My support system and coaches are great, and I probably wouldn’t be able to [do it all] without them – Madison. After practice and games, your bed is calling your name. So you do your work at school before practice and games. Our games are in the suburbs, and [me, Mackenzie and Madison] all live on the South Side. You don’t get home until 8 PM. You have to shower and eat. Now, it’s 9 PM – Camryn. My wrists started to hurt while we were at state. We were playing three matches a day for three days. I had to play through that. Once I saw we were close to being in first place, I just pushed through the pain and tried to win for our team – Mackenzie. I had an injury during the season. I had to go to the doctor for my wrist, get a bunch of X-rays, and take some time off. So Camryn and I didn’t get to play together in the beginning. After I took my time off, I was fine. We did awesome at state – Darinka. This is my fourth year on the team. It started off really rocky. I play doubles, so I usually know who my partner is coming into the season. But this year, we had a lot of injuries. I was going back and forth with partners and I didn’t get to really have a rhythm until sectionals. That’s a week before state. [Darinka and I] went down to state having only played a couple of games together. Everybody knows that’s not ideal. Usually, I’ve been playing with my partners for years. So I had to overcome. Everything happens for a reason – Camryn. In the semi-finals, Camryn and I were playing the no. 1 seed, [New Trier]. Obviously, they had the advantage. We had to dig deep and just battle. We had to overcome being the underdogs throughout the entire tournament – Darinka. Nobody expects anything from a CPS school. One time, this girl from another team asked me, “Oh. So you, like, live on the South Side?” I do. It’s crap like that that makes you want to beat the crap out of them. They ask dumb questions. That just gives me motivation – Madison. I’ve been playing tennis since I was four. I couldn’t even say the word ‘tennis.’ My family gave me a racket and I really didn’t have a choice. Growing up, my family and I would travel every weekend to tournaments all over the Midwest and in Florida, Texas, etc. I did all this work but I never won a tournament. It takes a toll on you when you don’t win. Why am I doing this? Why am I not winning? No colleges will want me. I watched all these girls pass me up and they’re not doing half of the things I’m doing. It’s a lot of negative energy, self-doubt and anxiety. I was done. Once we got down to state, and I saw how much progress we were making everyday, I knew this was what I was supposed to be doing – Camryn. We all have had those times where we’re like, “I’m done!” – Madison. My first choice is Spelman, but the gag is… Spelman doesn’t have a tennis team. My mom went to Spelman. My dad went to Morehouse. So they are all for it. My coach is not. He’s trying to give me the opportunity to continue playing. My top two are Spelman and Harvard. Harvard has a spot and I could play, but I want the full college experience and I think Spelman is going to give me that. I don’t think choosing Spelman means I’ll have to give up tennis. I could play club. I can create a club – Camryn. [Note: Camryn’s already been accepted into Spelman, and is waiting to hear back from Harvard]. I really like Howard. I’ve seen Howard’s tennis team already and I know a lot of people at Howard already. There’s another school I wanted to go to, but it’s an art school. It doesn’t have a tennis team. I want to play tennis in college but I also have to think about what I love to do. It’s going to be a hard choice – Madison. [Note: Madison’s already been accepted into Howard]. I’ve been looking at Howard, too, because my sister and I want to go there and play tennis together – Mackenzie. [Note: Mackenzie’s already been accepted into Howard]. I have two more years, but I for sure want to play tennis in college – Darinka. **Correction: An earlier version of this article stated that Camryn had been accepted to Harvard University. This article has been corrected. If you know a Chicago student-athlete who overcame a challenge to win big in his or her sport, please send an email to info@thetriibe.com.